here are lots and lots of Parker pens that can claim to be a special edition pen. It is perhaps pertinent to clarify the difference between a Limited Edition, a Special Edition and a Special Purpose Edition pen. A Limited Edition pen is produced in a finite, limited number. A Special Edition pen is produced for a limited time period, and a Special Purpose Edition is a pen that is produced for a special occasion, for instance a signing, a store opening, a movie or such. It’s not always easy to decide what should be called a Special Edition pen or not. Many pens are being ordered by companies in the line of company marketings, and are ordered in limited numbers and/or are being sold or given away for a limited time. This doesn’t mean that every Jotter or Vector with an imprinted company logo is a limited or special edition, although some pens, especially in the Duofold Centennial range, nevertheless has reached Special Edition status, like the 1992 Bank Menatep Centennial and the 2004 Rashin Centennial. nd is the legendary Parker T1 titanium pen a Limited Edition? It was made to honour the then ten years presence of the US in space and was made in the finite number of 104 000 fountain pens. Well, I’m not the one to judge. A true Limited Edition is however simple to spot. It’s numbered. There are also a multitude of pens produced for politicians, often referred to as the Presidential pens, or White House pens. There’s a list at the bottom of this chapter that by no means is a complete reference guide. There’s a White House tradition, dating back to Harry Truman, to sign important documents with several pens, and then giving the pens to the people who helped creating the bill or treaty. When Lyndon Johnson signed the Civil Rights Act in 1964 he is said to have used as many as 75 pens for the one signature, one short stroke at the time. John F. Kennedy had the strategy to spell out his middle name to be able to use more pens. The German pen company Montblanc really didn't like when Bill Clinton not only signed a document with a fake Montblanc, but also gave out more fake Montblancs as souvenirs. Barack Obama used 22 pens to sign the 2010 Patient Protection and Affordable Care Act. George W. Bush however preferred to use the one pen for the signing and then putting it in his own pocket, sharing unused ones as souvenirs. Is the T1 a Special Edition? EII Coronation. The first special Purpose Edition pen made by Parker was perhaps the QEII Coronation, produced as a set by Parker in England in 1953. It was offered in a blue hard pen box imprinted with the Royal emblem to celebrate the coronation of Queen Elisabeth II. It contained the new restyled Parker Victory MK V, which was fitted, like all the UK Duofolds, with the aerometric filling system that year. The pen, which has recently been found, is dark blue, which of course makes sense if referred to as Royal Blue. ut of course Parker had offered pens to dignitaries much earlier. A Parker pen was used to sign the agreement through which Italian and German forces surrendered in Northwest Italy during World War II, and General Eisenhower's Parker "51" were used to sign the Armistice pact for the European Front, while General Douglas MacArthur's 20-year-old Duofold was used to sign the document officially ending World War II. But these pens weren't specially made for the occasion. The QEII Coronation Victory pen and box. panish Treasure. The very idea of making a limited edition pen was unheard of until 1965. The prominent Parker collector Lih-Tah Wong tells the story on his site parker75.com. William Derbins, who was then the Vice President of Parker’s marketing department, read a story in the January 1965 edition of National Geographisc that caught his eye. The article told about Kip Wagner who used to find coins cast up by storms on the beach and eventually recovered a huge treasure from ships sunk in 1715, outside the coast of Florida. The silver was very worn, most coins were found as blackened lumps and most were not collector’s items, but rather salvaged for the silver value only. 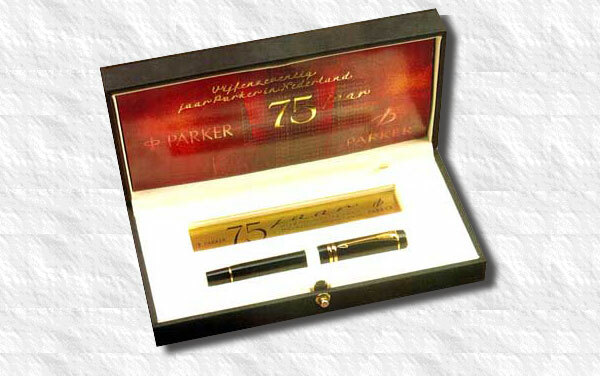 Parker had already launched their immensely popular Parker “75”, made from sterling silver, and William Derbins got the idea to produce a number of Parker “75” pens out of the Spanish Treasure gold as a marketing stunt. He would have discussed his idea with Parker’s chief designer Don Doman and Kenneth Parker and was evidently given the go-ahead. A product manager from Parker and William Derbins went to see Kip Wagner and persuaded him to let them buy the silver. The deal actually came at a convenient time for Wagner who was running out of treasure hunting-money. lready in November, ten months after Derbins read the article, the first Spanish Treasure pens were being shipped. The fountain pens were in fact produced all at once in a period of only a few days. Parker even had a notarius publicus to verify that the pens were in fact made from the treasure silver. number of 4 821 fountain pens were made. It sold for $75, (what else? ), which was three times as much as the ordinary Parker “75”. Ball pens were also produced from around 1966 in unknown numbers, collectors are guessing about 1 000-2 000 items only, actually making the ball pens rarer. The pens were delivered in a nice box, made from walnut wood which had a print of a treasure map on the lid, depicting the travels of the Spanish fleet, and inside a blueprint of the cargo storage room. Some of the silver cobs were actually shipped to the salesmen and used as premiums to customers who were hesitant to finish the deal to buy a pen. When Parker ran out of original silver coins they produced reproduction coins for the same purpose. Also in 1965 the American pen manufacturer Paul Fisher got a patent for a pen that would eventually work in zero gravity and the Fisher Space pen was chosen to be used on the 1968 Apollo 7 space flight. “Normal” ball pens didn’t work in space and the astronauts had previously been forced to use pencils only. Of course this discredited Parker who had used the phrase “Like a pen from another world” all the way back to the Vacumatic ads of the 1930’s and again in 1956 in the Parker “61” ads “A pen from outer space”. And of course Parkers own ballpen, the Jotter, was “The ballpen preferred the world over”, well it was… just not in space. tlas Booster Ball Pen. Having lost the “space race” Parker at least decided to produce a Special Purpose Edition pen to honour the 10th anniversary of NASA and in 1968 a Classic “75” style ballpoint pen in sterling silver ciselé was made. It had a push button made from the actual Atlas booster rocket that put John Glenn in orbit in February 20th of 1962. A fragment had been recovered from Africa and Parker managed to get hold of the metal. he pen was never ment to be sold to the public. Parker offered them as gifts for John Glenn, president Lyndon B. Johnson and heads and directors at NASA. Since then a few items have found their way to collector’s hands. The cap band of the pens has the following engraving: “U.S.A. into space” and “20 II 1962”. 250 items. tlas Booster Fountain Pen. There was also a Parker “75” fountain Space pen made in 1968, with the body entirely made from the rocket metal. Only four of these pens were manufactured. One was given to Glenn and the other to Johnson. Parker kept the other two for the archives. he pens were engraved “This pen is made from / a fragment of the rocket / which boosted astronaut John Glenn / into America’s first / orbit space flight / 20 February 1962”. One of the pens kept by Parker made it’s way into a collector’s hands at a pen show in 2000 where it sold for about $3 000. A year later it was sold at Bonhams for about $22 500. 4 items. pollo XV. In 1972 another Special Purpose Edition Parker “75” pen was made in titanium, possibly salvaged from the Apollo 15 mission. In any case it had a gold plaque attached to the body, which contained actual moon dust, collected by the astronauts James Irwing and David Scott on their mission. The plaque was imprinted “Traces of Lunar material / Apollo 15”. Only five pens were manufactured. hree of which were presented as gifts for President Richard Nixon, who kept one and offered the other two as gifts to high ranking politicians on his historic trip to China in 1972. And Parker kept the other two. One of which was also sold at a pen show auction in 2000 for about $4 500. A year later it was sold at Bonhams for a staggering $22 500. There are however indications from high end collectors that more than these five pens were produced. Apollo XV — Traces of Lunar Material. icentennial. In 1976 Parker wanted to commemorate the bicentennial of the declaration of independence in 1976 and produced a Parker “75” that was made from pewter, basically a tin alloy, widely used in the time period. It sported a ball ended clip, similar to the Duofolds of the 1920’s. Embedded in the cap top it had a piece of wood from the Independence hall, an American national landmark located in Philadelphia, Pennsylvania. Mostly famous because the US constitution, and the declaration of independence were prepared in the building. he wood was removed from the building when it was restored in 1897 and Parker was later able to buy a small quantity that came with certificates of authenticity from the historic society. It came in a handmade chest made form mahogany with an elaborate brass lock to resemble a jewel chest from the 1700’s. The pen cap was engraved “Wood in this limited edition pen / is a relic of Independence Hall / Philadelphia – 1776”. The pens were numbered and 10 000 items were produced. It’s known to collectors as the Bicentennial pen or the Americana pen. MS Queen Elizabeth. In 1977 a beautiful Parker “75” was made from brass that was salvaged form the wreck of the Atlantic ocean liner RMS Queen Elizabeth. Constructed in the 1930’s she was, for the next thirty years, the largest passenger liner ever built. She caught fire and sank in the Hong Kong harbour early in 1972. The pens had an oval plaque engraved “R.M.S. Queen Elizabeth”. ach of the 5 000 pens were numbered on the cap lip and came with an equal numbered certificate. There were two different wooden boxes offered. The larger one was made from mahogany had brass corner fittings and a lock with a key, not unlike a treasure chest. The smaller one was made from walnut wood that had been hand polished. The box sported a large brass plaque that featured a stylised drawing and information about the ship. ueens Silver Jubilee. To celebrate the Queen’s silver jubilee in 1977 Parker in the UK offered a Big red ball pen in Blue with the Union Jack printed on the cap. he body had the print “The Queen’s / Silver Jubilee 1977”. alcon. Although not a pen, to mark the introduction of the Parker “50”, nicknamed the Falcon, Parker in 1978 commissioned a limited edition of 100 statuettes of a Peregrine Falcon. t was based on a design by Alex Jardine, of the Society of Wildlife Artists and was made entirely out of Sterling Silver. ood Pen. In 1980 Parker in Germany produced a large (143 mm) wood limited edition pen with a huge stylised clip. There were eight different wood finishes offered and they were sold in numbered boxes made from the same wood as the pens. There were ment to be made 2 000 numbered pens of each wood, but there seems to have been objections from Parker in the US and production was haltered, so no-one really knows how many pens were shipped. Also some were clearly shipped without the number on the pens, or in the boxes. hey were made in the following woods: Grenadill, Ebony, Angelin, Cocobolo, Redwood, Guajac, Palissander, and Briar. They were fitted with a 14K nib that was very similar to the nib on the UK made Parker ”105”. The nib was fitted on a black section, held down by a broad gold band engraved PARKER. The cap had a very large gold coloured, wooden clip in the shape of an arrow that protruded from the top of the cap. Perhaps one of the strangest designs of a Parker pen, some finishes are considered very rare. Image © Bernard Bernolet courtesy of Bbpen.com AND Tsachi Mitsenmacher. harles' and Diana's Wedding. In 1981 Parker in Newhaven in the UK offered a limited edition Parker “105” to commemorate the wedding between Prince Charles and Lady Diana Spencer. The pen didn’t have any special features. Aside from a few special engravings it was an ordinary gold filled Parker “105” in oak bark finish. he pen body was engraved with the wedding date, the barrel end with the limited edition number and the crown top was engraved with the emblem of the Prince of Wales. It came with a certificate of authenticity marked with the edition number and a wooden box that sported a brass commemoration plaque. 1 000 numbered items were sold. ope John Paul II. In 1982 Pope John Paul II visited the United Kingdom and Parker commemorated the occasion by producing a Parker Arrow rollerball in stainless steel with the imprint "Pope John Paul II / British visit 1982. he pen also showed a small stylised head at the top of the clip. It was offered in a blue and black plastic box imprinted with the papal monogram, with a plain white cardboard slip-on cover. NF Treaty. In 1987 US President Reagan and Soviet General Secretary Gorbachev signed a historical treaty to eliminate the intermediate- and short range nuclear missiles. By 1991 a number of 2 692 missiles had been destroyed. Parker manufactured four pens of Parker "75" pens for the signing. They were made from sterling silver, based on the discontinued Keepsake design, with 22K gold trim and with an 18K solid gold nib. 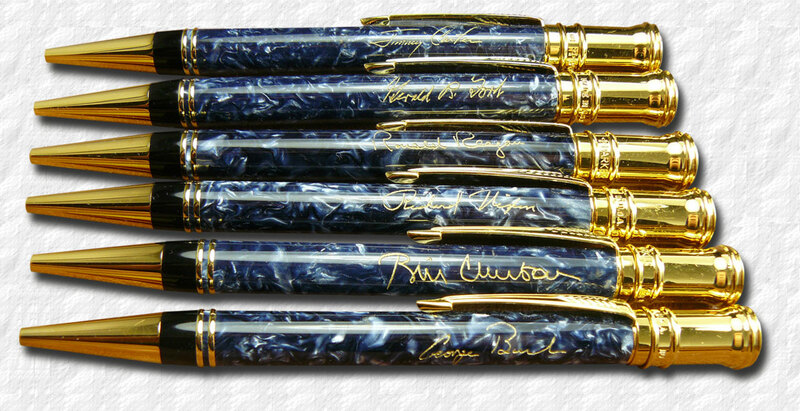 The White House provided Parker with the signatures of the two dignitaries, which were both engraved on each pen. Reagan also insisted that the title of both men should be engraved under the signatures. ichail Gorbachev used a fountain pen while Ronald Reagan preferred a felt tip pen. Gorbachev''s box was made from solid, hand-waxed Cherry wood with a Royal blue interior, but Reagan wanted his box to be made from mesquite wood. Two pens were used by Reagan and Gorbatchev for the signing, and of the two reserve pens made, one was eledgedly destroyed and one was kept for the Parker Archives. In 2007, Russian Federation President Vladimir Putin declared that the INF Treaty no longer served Russia's interests and considered pulling out of the treaty. ueen Elisabeth. Parker “61” gold filled signet set, pen and pencil. They had a blue crest on the body and was offered in a satin box, also printed with the royal crest. robably ordered by the Buckingham Palace around 1986 and used as gifts. Unknown number of items. entennial Collector Edition VIP. Parker celebrated it’s 100 year anniversary in 1988 and launched the Centennial Duofold to celebrate. This new pen was externally based on the 1920’s Big Red, but was made from sturdy acrylic and with a state of the art computer controlled manufacturing process. The Centennial was actually being manufactured already in late 1987, but in 1988 a Centennial Collector Edition was offered. It was a Blue marble parker centennial with the imprint 1888-1988 on the crown. It was offered as a set of a fountain pen and a ball pen that was manufactured in the UK but assebled in the US. These first limited edition pens were made in 50 numbered sets. hey weren't sold, but instead offered to VIP's in the US and UK. President Ronald Reagan, Vice President George Bush, resigning Secretary of Defense Caspar Weinberger and Secretary of Defense Frank Carlucci each got one; John Gibb, Parker Pen's chief sales executive to the White House during seven Presidential administrations, Peter Bentley, President of the Parker Pen Company, and Malcolm Troak, Parker's manufacturing Director also got one, among others. The pens were engraved on the cap bands with The Parker Centennial and the limited edition number. They were presented in a wooden box, made in Japan. 0 Downing Street. Margret Thatcher visited the Newhave factory in Newhaven, UK on October 10 1988. he was presented with a black Duofold Centennial in a grey box engraved with the coat of arms. uofold Cenetary Edition. A blue marble Duofold Centennial given to the workers at Newhaven to commemorate the cenetary jubilee and Thatcher’s visit to the factory on October 10 1988. he box contained a brochure commemorating the visit, a certificate and envelope typed with the employees name. entennial Collector Edition USA. The pen was initially black and later also in blue or red marble and didn’t differ much from the standard 1988 Centennial but had an additional crown in gold imprinted 1888-1988. It was shipped in a large grey cardboard box. he box contained a beautiful wooden desk stand with a brass plaque, a bottle of ink in a box, a polishing cloth and some paperwork. It had Centennial, the Parker halo and 1888-1988 engraved on the crown. entennial Collector Edition UK. There was also a Collector Edition offered in the UK in 1988 for the European market. hey were virtually the same but was offered in a smaller, grey box with a more frugal content, just the pen. The box was printed with the halo logo and Parker. est Ban Treaty. The 1974 treaty that prohibited underground nuclear weapon tests with a yield exceeding 150 kilotons was updated when Presidents George Bush and Michail Gorbachev in 1990 signed the Threshold Test Ban Treaty and Underground Nuclear Explosions for Peaceful Purposes Treaty, which provided for on-site inspections of nuclear weapon's tests above 35 kilotons (in comparison the Hiroshima bomb was at about 15 kilotons). Parker was commissioned to produce the pens for the signing. As with the 1987 Intermediate range treaty pens, these were also made from the Parker “75” Keepsake design, but Parked had added a 24K goldplating and mounted a blue sapphire on the crown. lso the pens were engraved with the President’s signatures. It was presented in a blue box inprinted with the two seals of the Soviet State Secretary and the US President and also denoting Washing, D.C / May 30-June 3, 1990. Inside was a wooden box with the same seals and text laser engraved. Inside the box the signatures of Bush and Gorbachev and their titles were also engraved. It is unclear how many pens were manufactured. There would have been a back-up set that probably made it back to the archives, but items in collector’s hands suggest that there were also some prototypes made. TART-1. In 1991 Parker was again called upon to produce pens, this time for the signing of the famous Strategic Arms Reduction Treat (START) wich concered the elimination of almost fifty percent of the nuclear warheads carried by ballistic missiles. It was signed by Soviet President Mikhail Gorbachev and US President George Bush and the pens used were again sterling silver Parker "75" Keepsakes, this time rollerballs. The pens were goldplated and the crown had an inlaid purple star sapphire. They were engraved with the President's signatures underlined with the title President. ike the Test Ban Treaty pens, it's hard to tell how many pens were actually manufactured. The boxes were also very similar, but the START-1 outer box was in burgundy imprinted with the Presidential seals and the text Moscow, USSR / July 1991. The inner, wooden box was engraved the same way. The START-1 treaty expired in 2009 and in 2010 US President Obama and Russian President Medvedev signed a new treaty, by then Parker were no longer an American company and the White House nowadays use Cross pens for their signings. isaster Relief. In 1991 Parker was commissioned to produce a World Memorial Missile Disaster relief pen. made from the smelted metal from Soviet SS20 and American Pershing nuclear missiles, which were removed from European soil. A portion of proceeds from the sales was donated to the charity fund for worldwide disaster relief. Parker accepted the challenge to convert the metal from the decommissioned missiles into a pen, but the metal turned out to be too porous for the manufacturing process . Instead it was decided that the pens should be fitted with a crown or emblem made from the metal featuring the fund's whistle logo. Once a call to battle, the whistle was selected by the fund to now symbolize the call to help. 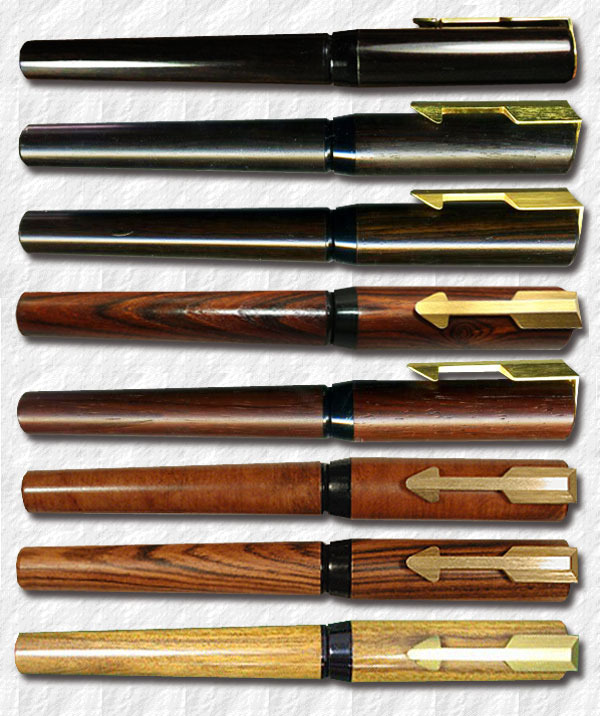 Eight different writing instruments were being manufactured as World Memorial Pens. The high-end pens were Duofold Black International Fountain Pens and Ball Pens. he official numbers of produced pens are 10 000. 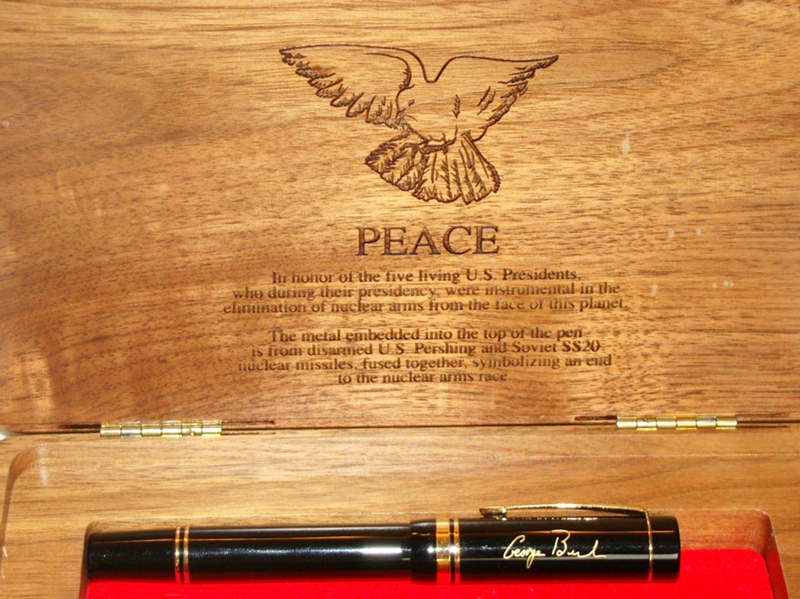 These pens were packaged in a special cherry wood gift box bearing a plaque of the missile metal, accompanied by a numbered certificate of authenticity. Prices for these limited edition pens were $300 for the fountain pen and $175 for the ball pen. Parker also manufactured Insignias as World Memorial Pens with the whistle logo emblem affixed to the arrow clips. Models offered were 14K Dimonite G Ball Pen and Pen/Pencil Set; Black Laque Ball Pen and Pen/Pencil Set; and Stainless GT (gold trim) Ball Pen and Pen/Pencil Set. Prices for the Insignia Memorial Pens ranged from $30 to $45 for an individual pen and $60 to $90 for a set. ive Presidents. November 4th in 1991 the Ronald Reagan presidential library opened in Simi Valley, California, about 60 km northwest of Downtown Los Angeles. The then five living presidents, Richard Nixon, Gerald Ford, George Bush, Jimmy Carter and Ronald Reagan were present at the opening. arker presented them each with a black ballpoint Duofold Centennial with the Presidential seal on the crown, and engraved signatures of the presidents. It was offered in walnut box also with the names of all five presidents and the Presidential seal. Image © and courtesy of "Cyndycyn4"
Five presidents with George Bush pen. ohn Major World Memorial. 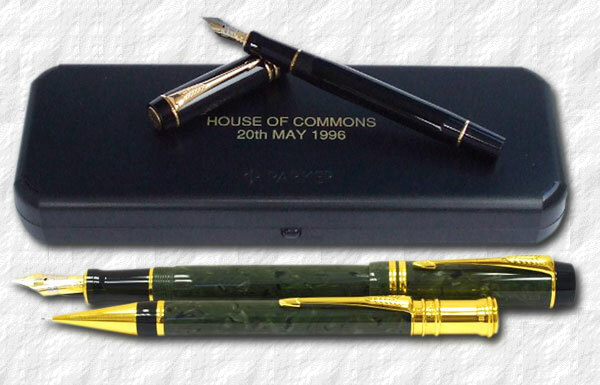 In November 1991 the UK Prime Minister John Major received a World Memorial pen as a gift from Parker. range Special Edition. In 1991 Parker offered a Centennial fountain pen and mechanical set in Orange as a Special Edition. The pencils were based on the 1920’s “Big Bro”. The fountain pens had a crown with the pendulum pattern. t was offered in a cherrywood box. 1 000 un-numbered sets were initially offered but the design became so popular that Parker continued to produce them for several years, adding an International sized fountain pen, ball pen and a roller ball to the line in 1992. In 1993 it was still referred to as a Special Edition, but from 1994 it was part of the regular line although it was discontinued in 1995.
enatep Bank. In 1992 Russian Menatep Bank ordered an unknown number of Duofold Centennials in red marble with the bank logo on the crown. enatep was the first private bank in Russia since the revolution, created by oligarch Mikhail Khodorovsky. The bank went bankrupt in 2001. Unknown number of items. oint Understanding. Parker produced two Orange Special Edition rollerballs used in June 17, 1992. t was used by Presidents Boris Yeltsin and George Bush signing the Joint Understanding of arms reduction. 2 items. Joint Understanding — Image Wanted. ix Presidents. 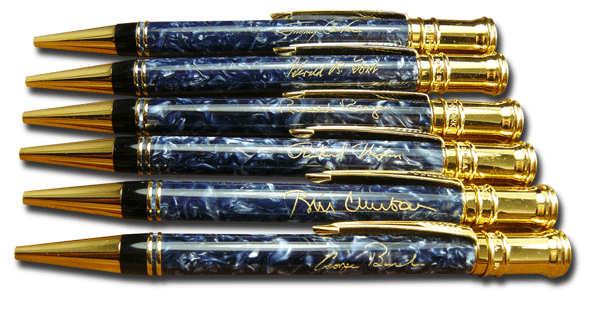 Around 1993 Parker made a Centennial Duofold with the signatures of all six living Presidents. he sixth was Bill Clinton. Richard Nixon died in 1994.
tart-II. January, 3rd, 1993 Presidents Bush and Yeltsin signed the Start-II treaty, banning the use of multiple independently targetable reentry vehicles. Parker produced black Duofold Centennial rollerballs for the occasion. hey were featured with plaques made from the same fused metal used in the World Memorial pens. They were offered in walnut boxes engraved with Moscow and the date. slo Accords. In an attempt to resolve the Palestinian-Israeli conflict secret negociations between Israel’s Prime Minister Yitzak Rabin and PLO chairman Yasser Arafat were held in Oslo, Norway. In September 12, 1993 an official signing of documents were held at the White House in the US, together with President Bill Clinton. sraeli foreign minister, Shimon Peres, US Secretary of State, Warren Christopher, Russian Foreign Minister Andrei Kozyrev and Arafat’s right hand Mahmoud Abbas did the actual signing. 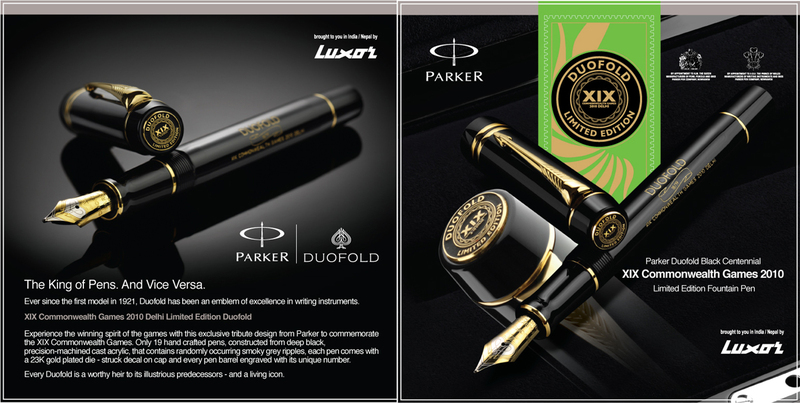 Parker provided black Duofold Centennial rollerballs for the historic signing. Arafat, Rabin and Peres, received the Nobel Peace Prize in 1994 for their work. Rabin was assassinated in November 1995 by a right-wing Zionist for his support of the Oslo Accords. Benjamin Netanyahu dissolved the Oslo accords in 1997. 8 items. Oslo Accords — Image Wanted. andarin. In 1995 Parker offered a Duofold Centennial Mandarin Limited Edition. It sported 3 solid gold rings. The body was engraved George S. Parker and featured the old Lucky Curve ribbon engraved with the number of the pen. he crown was engraved “Parker Duofold Mandarin” and the number. It was offered in an attractive yellow and black box. 10 000 items were produced, of which 3 000 were sold in the US. ouglas MacArthur. In Sept 2, 1945 General Douglas MacArthur signed the documents that ended World War II with Japan. He used a twenty year old Duofold Big Red that he had borrowed from his wife. The original pen was later lost. Parker made an orange Limited Edition pen in 1995 to mark the 50 year celebration of the event. t featured MacArthur's signature on the cap and on the solid gold crown the "Ruptured Duck" was imprinted, the symbol used by WWII veterans. The crown also had the five general stars on top and the limited edition number was engraved on the clip screw. In a private ceremony 96 year old Jean MacArthur received #1 of the limited edition series. The pen was shipped in a cherry wood box. It was produced in 1 945 items. ouse of commons. May 20th in 1996 Parker held a reception at the House of Commons in London. The event was to relaunch the Duofold Centennial and International range, which had been redesigned. Both pen aficionados and celebrities had been cordially invited and the guests were presented with a gift bag with a commemorative Duofold Fountain Pen and a lapel badge. here were examples of all the new finishes and also ballpens and mechanical pencils. The pens didn't have any additional imprints to mark the occasion, but the box had "House of commons/ 20th May 1996" printed on the lid..
orman Rockwell. Norman Rockwell was a 20th-century American painter and illustrator, and in the 1950's Parker persuaded him to paint ads for the company. To celebrate the Duofold pen being around for 75 year Parker in 1996 offered a Duofold Centennial Norman Rockwell Limited Edition. It featured Rockwell's silhouette on the crown and was imprinted "Parker Duofold Norman Rockwell Limited Edition". It sported Rockwells stylised signature on the cap. Parker initially had some problem reproducing the plastic of the 1920-30's Moderne Duofold in Black and Pearl (the original plastic contained ground fish scales and was very prone to discolouration). he Rockwell plastic is a very swirly version of the black and pearl, attractive and quite unique to the Norman Rockwell Limited Edition pens. The cap had three cap rings, like many other Limited Edition pens. It was offered in a fiddleback maple box imprinted with a Rockwell silhouette emblem. The box also contained four prints reproductions of original art. Three of which the original art still belongs to the parker family. The outer box was made in brown leather with metal corner protectors. 3 500 items. tylo de l'année. In 1996 the Duofold was nominated by the French Chambre Syndicale Nationale du Stylo as the pen of the year. o commemorate the event Parker produced a black International Special Edition with "1996" logo on the crown. It was offered in a orange and black box. 1 200 items were produced. ong Kong. Hong Kong was a colony of the British Empire and in 1898 Britain obtained a 99-year lease from China. hen the lease expired in 1997 it was commemorated with a black Duofold Centennial Special Edition with the Hong Kong logo on the crown. 300 items were produced, although some sources suggest 556 items. ilver Black and pearl. 1997 Duofold International Black and pearl Special Edition with silver trim. t was made in 100 items. Black and pearl with silver trim. nake. Maybe the most famous of the Parker Limited Editions, based on maybe the most legendary of the vintage Parker pens, the Lucky Curve filigree Snake #37, which was the silver version, and the #38 that was the gold filled version, introduced in 1906. n 1997 Parker introduced the Duofold Centennial Silver snake limited edition in 5 000 items. The eyes of the limited edition snakes were made from emeralds, while the original snake pens eyes were made from rhinestone. They were offered in a suede-lined, black leather gift box. Gold Snake. The Duofold Centennial Solid gold snake version was made in 250 items. ydney Olympics. In 1997 Parker offered a black Duofold Centennial Limited Edition for the upcoming Sydney Olympics, held in Australia in 2000. The pen had the Sydney 2000 logo, the olympic rings and the Limited Edition number on the crown. he logo was also found imprinted on the barrel. The pen sported two solid gold cap rings. It was presented in a dark red wooden box, also with the Sydney 2000 logo. 500 pens were manufactured. agritte. In 1998 Parker produced a Lapis Lazulii Duofold Centennial for the Benelux countries markets to commemorate the 100 year jubilee of the Belgian artist René Magritte. The pen had his signature on the cap and the crown sported a stylised white bird. t was presented in one of the more elaborate boxes for a Parker Limited Edition pen. It was made like a mirror cabinet, with the mirrors reflecting one of Magrittes paintings. The box also contained a bronze paperweight in the shape of an apple. 300 items. srael 50th. In 1998 Parker made a black Duofold Centennial to commemorate the 50th anniversary of the foundation of the state of Israel. The cap was engraved on one side “Israel's 50th” and on the other side the Limited Edition number. he crown had the emblem of the state of Israel, the Menorah, and the cap had two cap bands. It was offered in a cherry wood box with a round laser engraved Israel 50 emblem. 500 numbered items were produced. reenwich. To commemorate the Millennium and the the Royal Observatory in Greenwich Parker in 1999 offered a Duofold Centennial Special Edition as a set, fountain pen and roller ball. The crown was imprinted with”Parker Duofold”, an arrow and a banner with “Greenwich” inside. lthough black, the pen was machine chased with an attractive fouchére pattern. The cap had a broad gold band that was also engraved “Parker Duofold Greenwich”. About 3 000 un-numbered fountain pens were produced and probably less than a 1 000 rollerballs. usain. In 1999 Parker offered a Sonnet fountain pen to honour the Indian modernistic painter Maqbool Fida (M. F.) Husain, sometimes referred to as the “Picasso of India”. he pen also marketed Husain’s 2000 movie Gaja Gamini (One with a walk like an elephant), which he wrote and directed. The pen came with a laser engraved rendition of scenes from the movie and the signature of M.F. Husain. Unknown number of items. nsignia Greenwich. The Insignia Greenwich Millennium edition was offered in 2000 to commemorate the new Millennium and the Greenwich Observatory. t was a Parker Insignia, a stainless steel ball pen with gold trim. It also came with a free mug with the Greenwich logo. Unknown number of items. Insignia Greenwich — image wanted. onnet Greenwich. See above. Sonnet roller ball in laque black. ffered with a free B6 organiser. Unknown number of items. Sonnet Greenwich — image wanted. ector Greenwich. The Vector Millennium Special edition was offered was offered in 2000 to commemorate the new Millennium. It was produced in two finishes and in four high gloss colours; standard in black and blue and translucent in red, blue and green, and was made by the Parker-Luxor factory in India. t was printed with a world map with major cities on the body, making it possible to tell the time difference between various parts of the world with the twist of the cap. Unknown number of items. Vectory Greenwich — image wanted. aki-e. In the Japanese year of the Dragon in 2000, Parker in Japan began producing Maki-e pens for the Japanese market. hey were based on black UK made Parker Duofold Centennials and were made with age-old laquer techniques. The Parker Maki-e designs are covered separately below. ederland. Already in 1925 Parker pens were being distributed in the Netherlands and in 2000 Parker offered a Limited Edition Duofold International in black to commemorate 75 years in the Netherlands. It had “Parker 75” and the “P”-logo on the crown and was offered in a black box. n the the box’s inside lid and on a brass plaque there was inscribed "Vijfenzeventig jaar Parker in Nederland" (Parker seventy-five years in the Netherlands) and both the old “halo” logo and the then new “P” Parker logo were featured. The pens were each numbered on the back of the clip washer, 500 items were produced. osaic Blue. In 2001 Parker released a Duofold International Blue Mosaic Special Edition, inspired by the ancient Roman art form. The pens were produced using a new computer controlled technique that allowed for intricate patterns. he fountain pen was offered in the International size only, roller ball, ball pen and mechanical pencil. It sported a platinum plated trim. Some sources claim that 10 000 pens and 2 000 pencils were produced. urgundy Limited Edition. In 2001 Parker released the Duofold Centennial Burgundy as a fountain and ball pen. It was made exclusively for the Chinese market. The cap sported three gold rings and a crown engraved Parker Duofold Burgundy and the limited number. nitially 2 000 sets were produced. The box was black with a gold plated brass plaque imprinted with Duofold Parker fountain pen Burgundy Limited Edition and the limited edition number. urgundy Special Edition. There was also a non-numbered version of the Burgundy being offered as a set in either a red or brown wooden box. These pens had the crown engraving “Parker Duofold Burgundy Fountain pen”, and “Ball pen” respectively. he text resting on the Parker pendulum pattern but sans the limited edition number. The outer box was marked Special Edition, as opposed to the numbered Limited Edition. ccession Limited Edition. Celebrating Queen Elizabeth II 50 years on the throne in 2002 Parker offered the Duofold International Accession Limited Edition which was fully overlaid in heavy 23k gold plating. The nib was 18K gold with the ER crest. The body was etched with an extract from the proclamation of accession: "Queen Elizabeth II by the Grace of God, Queen of the Realm and of Her other Realms and Territories, Head of the Commonwealth, Defender of the Faith". he pen crown was fitted with a 1,5k amethyst with the golden jubilee crest and it was offered in an oval (Royal) purple box with the crest on a gold filled plaque on the the lid. It was produced in 2 500 numbered items and #1 was offered as a gift to the Queen, while #2 was given to Prince Charles. ccession Special Edition. The same event was commemorated with a less heavily priced purple Sonnet Special Edition with an engraved gold filled cap and 23K gold plated nib with the ER crest. t was offered in a similar box but was not numbered. Both Fountain pens and ball pens were offered. Unknown number of items. arker “51”. Following a lot of research Parker in 2002 offered a Special Edition to celebrate the world’s most sold fountain pen, the Parker “51”. While most old versions utilised the aerometric filling system, the Special Edition pens were cartridge/converter fillers. They were offered in a selection of two colours, Vista Blue and Black and sported caps designed like the legendary Empire caps in two-tone gold, offered in the 1940’s. The Special Edition caps were made from sterling silver for the Vista Blue and in two-tone gold vermeil sterling for the Black version. The clips were modelled after the Blue Diamond clips of the 1940’s. They were offered in boxes of faux snakeskin, similar to Parker boxes made in the UK in the 1950’s. hey sold for $350. The Special Edition Parker “51” invited to some controversy among collectors. Some claimed that Parker should have been more true to the original design, while others saw the new version as a modern improvement since it could be used with cartridges. To complicate things further, the first pens shipped suffered from a manufacturing flaw that led the barrel and section to crack easily. Parker did however correct this in the later production. Unfortunately, although the pens came with a lifetime warranty, Parker reportedly no longer has the appropriate spare parts in stock. osaic red. Since the 2001 Blue Mosaic Special Edition sold very well Parker in 2002 offered a Duofold in Mosaic Red. lso the red version were produced in 10 000 items only. osaic black. Customers had complained that the Mosaic Blue and Red fountain pens came in the International size only. o when the Mosaic Black Special Edition was offered in 2003 a Centennial size was added to the series. t. Petersburg. In 2003 Parker offered a dark blue Duofold Centennial Limited Edition to commemorate the 300 year jubilee of the Russian city St. Petersburg. The body was chased in a wavy pattern to resemble the blue waves of the river Neva and the crown sported the official emblem of the jubilee, the admiralty ship. St. Petersburg was founded in 1617 by Tsar Peter the Great when he retrieved the city Nyen from the occupying Swedes. he city was named St. Petersburg in 1703 and became the capitol of Russia in 1712, renamed again in 1914 to Petrograd when Russia went to war against the Germans in WWI and didn’t want their capitol to have what sounded like a German name. And yet again, three days after Lenin’s death in 1924 the city was renamed Leningrad. In 1991 the people of St. Petersburg voted to change the name back to the old name. The pen was produced in 300 items only. t. Petersburg VIP. Also in 2003 Parker made a VIP version of the St. Petersburg in a 23K gold plated finish with the Neva waves etched in the gold. hese pens were not for sale but were presented to members of the Government of the Russian Federation, Administration of St. Petersburg and prominent citizens of the city’s culture and arts. 10 pens were made. 15 Memorial. In 2003 the Parker pen company turned 115 years and Parker in Hong Kong decided to commemorate this with a Sonnet 115 Memorial Edition, made for the Asian market, although the pens were made in France. Two designs were offered, Sterling Silver and Pink Gold Cascade. he fountain pens were made in 3 000 items respectively and 1 500 ball pens of each finish were also offered. They came in a grey or yellow box printed with the number 115. The box also contained a “memorial paperweight”. ashin. In 2004 the Japanese department store Maruzen decided to celebrate their 135th year anniversary and commissioned a Limited Edition series of Parker Duofold Centennials. Parker came up with a blue finish chased much in the same manner as the old Lucky Curve pens of the late 1800’s. Maruzen had a company song called “Look through the wind” composed already in 1938 by Kosaku Yamada (music) and Hakushu Kitahara (lyrics). compass is important in the song and the company decided to use a compass as the company emblem. The compass was featured on the crown of the pen which was sold throughout the 31 Mazuren stores and cost 63 000 Japanese yen. It was introduced June 18, 2004 and was offered in a box with a book like design with an outer box printed with the compass logo. Only 300 items were produced, the Limited Edition number imprinted on the cap band. instripe. In 2004 Parker launched a Special Edition design called the Pinstripe. It was offered in two finishes, Navy and Chocolate. It featured three cap rings and the Navy design had body stripes of dark blue, opal white and grey accented by a platinum plated trim. he Chocolate finish featured stripes of rich velvety mocha, opal white and turquoise accented by an exclusive champagne gold trim box with a drawer, accentuating the clothes theme. Unknown number produced. Image © courtesy Tsachi Mitsenmacher. ce Blue. In 2004 Parker offered two very attractive Special Edition Sonnets inspired by the works of the Irish architect, artist and designer Eileen Grey (1878-1976). The Ice Blue had a matte blue cap with a broad cap ring and a 18K rhodium plated gold nib. he body was solid sterling silver shaped in an intricate pattern. Fountain pens, roller balls and ball pens were offered in a special designed white box with a blue band marked “Gift Edition”. erracotta. The second Eileen Grey-inspired special edition Sonnet in 2004 was the Terracotta, with a brown red laquer body and a gold plated cap with a pattern similar to that of the body of the Ice Blue. he Terracotta had an 18k nib and was presented in a yellow Gift Edition box with a terracotta coloured band. otter Premier Edition. In January 5, 1954 Parker launched the company’s first ball point pen, the Jotter. While the ball points had been buzzing for several years, Parker early decided that they would stay out of that particular business until they had a fully functional ball pen. While other companies folded, Parker were still collecting revenue from their best seller fountain pen, the Parker “51”. Well Parker sneaked out their Hopalong Cassidy ball pen in 1950 but that was more of a marketing stunt than a true effort. fter nine years of research they eventually launched the Jotter and it made a killing on the ball pen market. Almost sixty years later the Jotter is still going strong. To celebrate 50 years of Jotters, Parker in 2005 offered a special Jubilee anniversary edition. The design was based on the original Jotter Filigree introduced at the New York Fair in 1959. The Jotter Premier Edition had a sterling silver cap and button, engraved “50”, and a filigree sleeve on the body. The two finishes were Licorice Black, and saffron yellow. The featherless clip was similar to that on the earliest Jotters. sparto. When Parker launched their high end Esparto-series in 2005 they advertised the Esparto weave pattern design as being influenced by the jazz age and Art Deco. The pens had two cap bands centered by a third in black. Two designs were offered, the solid sterling silver version had platinum plated trim and the 18K solid gold version had gold trim. hey were offered as fountain pens and ball pens, but only in the smaller International size. Choosing a third way in the Special Edition jungle, the solid gold Esparto is a Numbered Edition, numbered but not limited, that is. ig Red China. Big Red was of course the nickname for the first red Duofolds back in the 1920’s. In 2005 Parker produced a Duofold Centennial Big Red made especially for the Asian market. The pen had three cap bands and the body impring echoed the original imprint with the words “Duofolde” and the old Lucky Curve banner which featured the Limited Edition number. he number was also imprinted oin a plaswtic card in the box which also contained a bottle of Penman ink. While old Duofold advertising sometimes featured a scarlet tanager carrying a Duofold, the 2005 Big red had a white dove on the crown, carrying the Parker arrow, symbolising peace. 1100 pens were produced. hristmas. 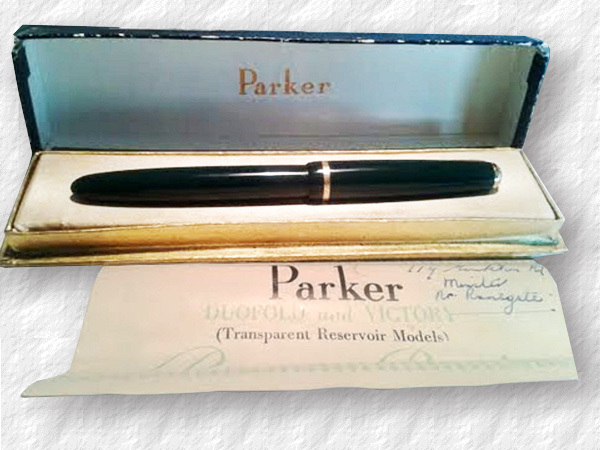 Just before Christmas in 2005 Parker offered a Special Edition Sonnet fountain pen and ball point. t was made in a 23K plated pink gold finish on heavy brass in a ribbed pattern and a 18K gold nib. Unknown number of items. heck. When Parker launched the Duofold Check Special Edition in 2005 it was closely related to the Mosaic of previous years. The design consisted of a multitude of small squares of different colour and hue. Three models were offered, Amber, Marine and Olive. hey were offered in both Centennial and International sizes and also as roller balls and ball pens. The Amber design had 23K gold plated trim and a 18K solid gold nib plated with platinum while the Marine and Olive had platinum trim and 18K two-tone nibs. In 2008 Check Citrine was introduced, while the Olive was discontinued in 2009. Also in 2009 Demi versions were offered. rocodile. In 2006 Parker offered the Sonnet Crocodile Vermeil Special Edition. It was a 23K gold plate over sterling silver with rhodium plated finish, creating a pattern like the skin of a crocodile. t had a two-tone 18K gold and rhodium nib. It was offered as a fountain pen only. loisonné. More than ten years had passed since Parker had offered a yellow Duofold Centennial, with the Mandarin Limited Edition. The vintage Duofold Mandarin of the 1920’s continued to fetch high prices among collector’s and Parker decided that it was time for a new version. In 2006 the Mandarin Cloisonné was launched. While the Mandarin had three cap rings, the Cloisonné cap had only two. Like the Mandarin, the Cloisonné body was imprinted Geo. S. Parker / Parker pen Co / Fountain pen/ Duofold and sported the old Lucky Curve banner with the limited edition number inside. ince George Parker had gotten the idea for the original 1927 Mandarin Duofold, after buying a yellow vase on one of his trips to China, the Cloisonné featured a stylised vase on the crown, made in an ancient technique used when decorating metal objects called – yes you guessed it - cloisonné. The pen came with a warranty and a bottle of Penman ink in a decorated black laquer presentation box. 3 900 pens were produced. ueen’s Edition. In 2006, to celebrate Queen Elizabeth II’s 80th birthday, Parker crafted an 18K solid gold Duofold International in a limited edition of just eight pens. ach pen was numbered and decorated with a design inspired by the portcullis (gliding grille door) insignia associated with British Royalty for more than 600 years. #1 was presented as a birthday gift to the Queen herself, while the others were auctioned. It was offered in a wooden box covered and lined in Royal Purple, with a lock and key. umblebee. Parker celebrated the London Pen Show in 2007 by producing a very cool Duofold Centennial in a design inspired by the Vacumatics of the 1930’s and 1940’s. It featured white edged yellow stripes alternating with transparent acrylic and black ends. The cap had three cap bands and the black imprint read Geo. S. Parker/ Fountain pen /Duofold/ Newhaven Sx. / Made in UK. t featured the Lucky Curve banner with the limited edition number inside. 100 pens were produced but thirteen pens never left Parker, so there were in fact only 87 pens available. The crown was imprinted Parker Duofold Fountain pen London. The pen was offered in a laquer wood box. Pen manufacturer Brad Torelli made an oversize Vacumatic from "Bumblebee" stock for a prominent Parker employee. Image © and courtesy Dave Ruderman. rue Blue. The True Blue of the 1920’s was a low priced alternative to the Duofold, but it’s intricate colour and subtle beauty has made it very popular among collectors. In 2007 Parker reproduced the colour of the True Blue for a Limited Edition Duofold Centennial. While the original pens either had one or two cap bands, the Limited Edition had three. he pen was fitted with 18K Solid Gold nib with rhodium highlight and hand polished platinum alloy point. The crown repeated the pen-pattern and also featured the Limited Edition number. It was shipped in a deep blue laquer wooden box with a bottle of Penman ink and a warranty card. 5 000 items were offered world wide. alaysia 50. In 1957 Prime Minister Tunku Abdul Rahman (1903—1990) used a Parker “61” to sign the Malaysia independence agreement with the British government. To celebrate the event Parker in 2007 offered a Limited Edition. The original Parker “61” pen used by Tunku is on display at the Proclamation of Independence Memorial in Malacca, the very site where Tunku declared the country's independence on the field in front of the club in 1956. hile the original pen was a capillary filler, the Limited Edition utilised a converter. The Vista Blue pen had a lustraloy cap, engraved with the Limited Edition number. The Limited Edition pens were produced from genuine vintage Parker “61” pens, reconditioned and with new replacement parts. The 50 items were presented in a dark laquer wooden box with a bottle of Penman ink and a warranty card. ucky 8. Back in the late 1800’s few pens sported a clip and many pens broke after simply rolling off the table. George Parker solved this problem by offering a hexagonal pen that stayed where you put it, later it was given the article number #8. In 1916 Parker’s washer clip was introduced, and there were no longer any need for hexagon pens. hen the Limited Edition pen was launched in 2008 to commemorate Parkers 120’s anniversary (the company had started out in 1888) it was designed in deep black with smokey grey ripples and it was octagonal. The cap band had borrowed it’s design from another pen, the legendary Vacumatic banded Vacumatic, offer for a short while in 1937. The crown was imprinted Parker Duofold Lucky 8, 1888—2008. The nib was 18K solid gold and the pen was presented in an octagonal black laquer wooden box. 3 888 items were produced. Image © and courtesy of Tsachi Mitsenmacher. u 福. Fu means Happiness in Chinese and in 2008 Parker offered a red Duofold Centennial made for the Asian market. It was dark red with black ends and three cap bands. It’s been said that the red colour for the Chinese represents warmth, joy, happiness, respect and life force. It had a solid gold 18K nib and the crown was imprinted Duofold and the Chinese sign “Fu” The nib was specially made to allow for the more traditional upright pen position when writing. t was shipped in a in a black laquer wooden bock ornamented with stylised Chinese swirling dragon clouds and the Fu-sign in red and with a cool sliding lid. An extra bonus was a bottle of the excellent Penman Sapphire ink, much sought for by collectors. 1 399 items was produced. NA black. In 2009 Parker produced a heavily chased pearlescent smoke dark greyish black Duofold Centennial inspired by the double helix of DNA. The trim was in platinum and the cap band was a version of the one used on the Lucky 8, engraved Parker. he crown read Parker Duofold and featured the pendulum pattern. It was offered in a large black laquer wooden box. 1 088 items were produced. NA red. Also in 2009 Parker produced a version of the DNA in flame red for the Writing equipment Society’s London Pen Show. 00 pens were produced but only 91 left Parker. hina 60th. In 2009 Parker produced a Duofold Centennial Fountain Pen, made for the Chinese market, in a red acrylic very similar to the DNA flame red. It commemorated the establishment of the People’s Republic of China in 1949. t sported three cap bands and gold filled trim. The crown read “China 1949-2009” and a picture a stylised sun and oriental palace. It was offered in a red box with a bottle of Parker Penman ink. 800 items. atman. In 2009 Parker offered a Vector printed with Batman logo as a FP and BP in an official licensed Special Edition in two different bubble cards for the fountain and ball pen. t was also offered as a set in a black faux leather pen pouch with zippers, again with the Batman logo. It was made in the UK for the European market in an unknown number of items. ewhaven staff. When the Newhaven factory was being shut down in 2010 Parker made a Duofold International in black and pearl which was presented to the factory workers. The certificate of authenticity stated that it was to acknowledge the dedication of the Newhaven staff. he crown featured the new halo logo and read “Parker Newhaven 1941—2010”. It was offered in a black bag with an outer cardboard box inside containing a laquer wooden box with the pen. The rumour is that a production of 180 items were planned to be made, but already after the first wave of 20, items began popping up for sale on auction sites, so Parker allegedly stopped the production and recalled 14 of the 20.
lue Stripe Senior. In 2010 Parker introduced a Duofold Centennial Limited Edition designed after the so called Duofold Vacumatics of the 1940’s. While the original design were either Vacumatic or button fillers the Limited Edition was of course a cartridge/converter filler. hile most Centennials had black ends the Senior had a nickel palladium plated trim, including the ends. 18K gold and platinum nib and a crown the same colour as the body. 888 items. kkerman. In 2010 the Dutch pen shop P.W. Akkerman (Pieter Willem) celebrated 100 years. Parker made a Duofold Centennial Limited Edition Big Red for the grandson, Arthur, who still runs the shop. he crown featured a depiction of the roundabout in the Passage where the Akkerman shop is located in red and read “Akkerman 1910-2010 / Den Haag”. 201 fountain pens and 91 ball point pens were manufactured. ed stripe Senior. In 2011 a red version Duofold Centennial was added to the Stripe series. his time 1 000 pens were offered. IX. The Delhi Commonwealth Games Edition was made for the Indian games of 2011. It was a black Duofold Cemntennial with 23K gold filled trim nib and sported an 18K gold nib. And the roman numeral XIX (19) on the crown, for the 19th games. t was ordered by Luxor in India who makes several Parker pens in their factories in India. Prince Charles was presented with one of the pens on his visit to India. Luxor is the Official Writing Instruments Licensee for the Commonwealth Games. 18 pens were produced. rown stripe Senior. In late 2011 a brown version Duofold Centennial was added to the Stripe series lso the brown was offered in 1 000 items. aki-e Parkers: In the Japanese year of the Dragon in 2000, Parker in Japan began producing Maki-e pens in very limited editions for the Japanese market. They were based on black UK made Parker Duofold Centennials and were made with age-old laquer techniques. The first design, the Year of the Dragon, was made in a Limited Edition of only fifteen pens. ut in spite of being very high priced there was such a demand that Parker in 2001 hired a young Maki-e contractor by the name of Tatsuya Todo and commissioned him to do two more designs in larger series. Both these Maki-e’s also sold well and today more than 20 Limited Edition Designs have been offered. ear of the dragon. 2000 Duofold Centennial Maki-E 15 items. Year of the Dragon — image wanted. akura (Cherry blossoms). 2000 Duofold Centennial Maki-E Artisan: Tatuya Todo. 50 items. idare (Weeping cherry tree). 2000 Duofold Centennial Maki-E Artisan: Tatuya Todo 50 items. hikurin (bamboo forest). 2001 Duofold Centennial Maki-E Artisan: Tatuya Todo. 150 items. chi matsu (Young pine tree). 2002 Duofold Centennial Maki-E Artisan: Tatuya Todo. 70 items. i matsu (Old pine tree). 2002 Duofold Centennial Maki-E Artisan: Tatuya Todo. 70 items. umo (Spider). 2003 Duofold Centennial Maki-E Artisan: Shozan Hariyama. 60 items. aijin (Thunder God). 2003 Duofold Centennial Maki-E Artisan: Shozan Hariyama. 60 items. ujin (Divine wind). 2004 Duofold Centennial Maki-E Artisan: Hideo Tsukada. 30 items. ane (Feather). 2005 Duofold Centennial Maki-E Artisan: Tatuya Todo. 60 items. oma Inu (The Guardian). 2005 Duofold Centennial Maki-E Artisan: Shozan Hariyama. 130 items. hinese Lions. 2005 Duofold Centennial Maki-E 120 items. airyun (Twin Dragons). 2005 Duofold Centennial Maki-E Artisan: Hazama Yoshio. 88 items. anda. 2007 Duofold Centennial Maki-E Artisan: Shigeru Sawada. 150 items. oi (Carp). 2008 Duofold Centennial Makie-E 288 items. aru ran man (Spring blossom). 2008 Duofold Centennial Maki-E. 50 items. scending Tiger. 2010 Duofold Centennial Maki-E. 88 items. olden Dragon. 2011 Duofold Centennial Maki-E Artisan: Shigeru Sawada. 188 items. Special thanks to Bernard Bernolet, Lih-Tah Wong, Tom Westerlich, Jim Mamoulides, Lee Chait, Tsachi Mitsenmacher, David Shepherd, John C. Loring and Norimasa Kajita who helped me with information and images of these rare pens. •1965 Spanish Treasure. Parker “75”. 4 821 items. •1968 Pace Pen. Parker Classic Ballpoint. Not for sale. 250 items. •1968 The Space pen Fountain pen. Parker “75” Not for sale. 4 items. •1972 Traces of Lunar Apollo 15 metal. Parker “75” Containing actual Moon dust. 3 items. •1976 Bicentennial Parker “75” (aka Americana). 10 000 numbered items. •1977 RMS Queen Elizabeth. Parker “75” 5 000 numbered items. •1977 Queens silver Jubilee. Big red ball pen. Blue, flag on cap. Body The Queen’s / Silver Jubilee 1977. •1979 Falcon figurine. 100 items. •1980 Woodpen. 8 different. 2 000 items. •1981 Charles and Diana’s wedding. Parker “105” 1 000 numbered items. •1982 Pope's Visit. Parker Arrow. Stainless Steel Rollerball. Unknown number of items. •1987 INF. Parker “75” Intermediate range Nuclear Force Treaty Commemorative. 4 sets, one set destroyed. •1987 Queen Elisabeth. Parker “61” signet with a blue crest in the pen and pencil. Unknown number of items. •1988 Collector Edition. Duofold Centennial. Blue marble Centennial 1888-1988 on the crown. FP & BP. 50 sets. •1988 10 downing street. Black Centennial. 1 unnumbered item. •1988 Cenetary Edition. Centennial. Blue marble. To the workers at Newhaven. Unknown number of items. •1988 Collector Edition USA. Centennial, black, red or blue marble, 10 000 items. •1988 Collector Edition UK. Centennial. Black, or red or blue marble. 10 000 items. •1990 Test ban treaty. Parker “75”, unknown number of items. •1991 Start treaty. Parker “75”, unknown number of items. •1991 Five Presidents. Black ball pens Duofold Centennial. Unknown number of items. •1991 John Major World Memorial pen. Presented to UK Prime Minister John Major 28. One item. •1992 Menatep bank. Duofold Centennial Red marble, bank logo on the crown. Unknown number of items. •1992 Orange Special Edition. Parker Centennial. Unknown number of items. •1993 Six Presidents. Black Duofold Centennial. Signatures by Nixon, Ford, Bush, Carter, Reagan and Clinton. •1993 Start-II. Black Duofold Centennial rollerballs with World Memorial metal plaques 2 items. •1993 Oslo accords. Israel-palestine peace agreement. Black Duofold Centennial rollerball. 8 items. •1995 Mandarin. Duofold Centennial Mandarin. 3 solid gold rings. 10 000 numbered items. •1995 Douglas MacArthur. Orange Duofold Centennial, 50 years celebration WWI ending. 1 945 items. •1996 Norman Rockwell. Black and Pearl Duofold Centennial.Celebrating Duofold 75 years. 3 500 items. •1996 Stylo de l´année. Black Duofold International. Celebrating pen of the year nomination. 1 200 items. •1997 Hong Kong. Black Duofold Centennial. Celebrating Great Britain leaving Hong Kong. 300-556 items. •1997 Silver International. Duofold International Black and pearl with silver trim. Special Edition. 100 items. •1997 Silver Snake. Duofold Centennial with solid silver snake filigree. 5 000 items. •1997 Gold Snake. Duofold Centennial with solid gold snake filigree. 250 items. •1997 Sydney 2000 Olympics. Duofold Centennial with the Sydney 2000 logo and olympic rings. 500 items. •1998 Magritte. A Lapis Lazulii Duofold Centennial. Magritte 100 year celebration. Benelux only. 300 items. •1998 Israel 50th. Black Duofold Centennial. Commemorating Israels 50th year as a state. 500 numbered items. •1999 Greenwich. Black chased Duofold Centennial set, FP & RB. About 3 000 FP and less than 1 000 RB. •1999 Husain. Parker Sonnet. Marketing the M. F. Husain movie Gajagamini. Unknown number of items. •2000 Insignia Greenwich Millennium edition. Stainless Steel Gold Trim Ball pen. Unknown number of items. •2000 Sonnet Greenwich Millennium edition. RB. Laque Black. Unknown number of items. •2000 Vector Millennium. Standard: black or blue, translucent: red, blue or green. Unknown number of items. •2000 Nederland. Duofold Centennial, 75 years in the Netherlands, 500 items. •2001 Blue Mosaic. Duofold International. Special Edition Possibly 10 000 pens and 2 000 pencils. •2001 Burgundy LE. Centennial Duofold. FP & BP. Chinese market. 2 000 numbered sets. •2001 Burgundy SE. Centennial Duofold. FP & BP. Chinese market. Unknown number of items. •2002 Accession. Duofold Centennial. Queen Elizabeth II 50 years. 2 500 items. •2002 Sonnet Accession. Unknown number of items. •2002 Parker “51” Empire State Building (Special Edition) Vista Blue. unknown number of items. •2002 Parker “51” Empire State Building (Special Edition) Black. unknown number of items. •2002 Mosaic Red. Duofold International Special edition. Possibly 10 000 pens and 2 000 pencils. •2003 Black Mosaic. Duofold Centennial and International. Possibly 10 000 pens and 2 000 pencils. •2003 S:t Petersburg. Duofold Centennial. Dark blue. commemorate 300 years. 300 items. •2003 S:t Petersburg VIP. Duofold Centennial 23K gold plated. 10 items. •2003 Parker 115. Sonnet Memorial Edition Parker 115 years, Hong Kong. Unknown number of items. •2004 Rashin. Duofold Centennial Rashin (Compass). Store Maruzen's 135 year anniverasy. 300 items. •2004 Pinstripe. Special Edition Pinstripe Navy and chocolate. Unknown number of items. •2004 Jotter Premier Edition Sterling and Black. Unknown number of items. •2004 Jotter Premier Edition Sterling and Saffron. Unknown number of items. •2004 Ice Blue. Sonnet SE. Sterling silver body and blue cap. FP, RB and BP. Unknown number of items. •2004 Terracotta. Sonnet SE. GF cap brown body. FP, RB and BP. Unknown number of items. •2005 Presidential Silver Esparto. Duofold International FP & RB. Unknown number of items. •2005 Presidential Gold Esparto. Duofold International FP & RB. Numbered but not limited. •2005 Big Red. Duofold Centennial. Asian market. Duofold imprint. 1 100 items. •2005 Sonnet Christmas edition in 23K chased Pink Gold. Fp and BP. Unknown number of items. •2005 Pinstripe jet, amethyst, iced glass. Unknown number of items. •2005 Check. Amber, Marine, Olive. Cent. and International Duofold. FP, RB,BP. Unknown number of items. •2006 Crocodile. Sonnet vermeil rhodium plated finish Special Edition. FP only. Unknown number of items. •2006 Cloisonné. Duofold Centennial Mandarin. 2 rings. 3 900 items. •2006 Queen’s edition. Duofold International in 18K solid gold, 8 items. •2007 Duofold Centennial “Bumblebee” The London Duofold. Yelow stiped. 100 items. •2007 Duofold Centennial True Blue. 5 000 items. •2007 Malaysia 50. Parker 61 Vista Blue. Federation of Malaysia 50 years of independence. 50 items. •2008 Duofold Centennial Lucky 8. Celebrating Parker 120 years, 3 888 items. •2008 Fu. Duofold Centennial Fu (happiness). Red, made for the Chinese market. 1 399 items. •2009 Duofold Centennial DNA. Black. 1 088 items. •2009 Duofold Centennial DNA in red. WES members for the London pen show in 2009. 100 items. •2009 Duofold Centennial China 60th Fountain Pen, made for the Chinese market, 800 items. •2009 Vector Batman FP and BP Special Edition. unknown number of items. •2010 Newhaven Staff. Centennial pearl and black. Presented to the staff w factory closed 6—180 items. •2010 Blue Stripe. Duofold Centennial Senior, blue stripe, 888 items. •2010 Akkerman. Duofold Centennial Big Red, Dutch pen shop 100 year celebration, 201 FP items, 91 BP items. •2011 Duofold Centennial Senior, red stripe, 1 000 items. •2011 Duofold Centennial Senior, brown stripe, 1 000 items. 2000 Duofold Centennial Maki-E Year of the dragon. 15 items. 2000 Duofold Centennial Maki-E Sakura (Cherry blossoms). Artisan: Tatuya Todo. 50 items. 2000 Duofold Centennial Maki-E Sidare (Weeping cherry tree). Artisan: Tatuya Todo 50 items. 2001 Duofold Centennial Maki-E Chikurin (bamboo forest). Artisan: Tatuya Todo. 150 items. 2002 Duofold Centennial Maki-E Ichi matsu (Young pine tree). Artisan: Tatuya Todo. 70 items. 2002 Duofold Centennial Maki-E Oi matsu (Old pine tree). Artisan: Tatuya Todo. 70 items. 2003 Duofold Centennial Maki-E Kumo (Spider). Artisan: Shozan Hariyama. 60 items. 2003 Duofold Centennial Maki-E Raijin (Thunder God). Artisan: Shozan Hariyama. 60 items. 2004 Duofold Centennial Maki-E Fujin (Divine wind). Artisan: Hideo Tsukada. 30 items. 2005 Duofold Centennial Maki-E Hane (Feather). Artisan: Tatuya Todo. 60 items. 2005 Duofold Centennial Maki-E Koma Inu (The Guardian). Artisan: Shozan Hariyama. 130 items. 2005 Duofold Centennial Maki-E Chinese Lions. 120 items. 2005 Duofold Centennial Maki-E Tairyun (Twin Dragons). Artisan: Hazama Yoshio. 88 items. 2007 Duofold Centennial Maki-E Panda. Artisan: Shigeru Sawada. 150 items. 2008 Duofold Centennial Makie-E Koi (Carp). 288 items. 2008 Duofold Centenial Maki-E Haru ran man (Spring blossom), 50 items. 2010 Duofold Centennial Maki-E Ascending Tiger. 88 items. 2011 Duofold Centennial Maki-E Golden Dragon. Artisan: Shigeru Sawada. 188 items. Parker '45' Demonstrators were produced for only a brief time in the early 1960’s. Parker 45 'Demonstrator' perhaps the first Parker 'bill signer' - I am advised (second hand) that a gentleman who worked as a Congressional Aide saw President LBJ sign a bill using the Parker '45' 'Demonstrator' with an eagle seal pictured at page 10 and then was given the pen by LBJ. Thus we now know that notwithstanding the non-presidential seal it is a 'presidential' pen that entered the White House either during the JFK or the LBJ administration and at least had limited use by LBJ as a billsigner. While I could not find out which bill or date of signing, it would seem probable that it occurred during the period LBJ was using the Esterbrook 'bill signer' and before he settled on the Parker Eversharp felt tip. Thus while it has long been believed that the Parker Eversharp was the first of the Parker bill signers it now appears that that 'honor' belongs to the Parker 45 'Demonstrator'. Parker Eversharp. Felt tip, blue pen with chrome trim, signature and White House seal. Parker Eversharp. Felt tip, blue pen with gold trim, signature and White House seal. Nixon. The White House seal in blue chrome. Black Duofold BP with the Presidential seal on the cap? Practical yet elegant, our exclusive Centennial Celebration 2011 pen from Parker a true collectible. President Reagan used Parker pens while in office so we have created these to commemorate the 100th birthday of our 40th President. Beautifully engraved with "Centennial Celebration 2011", this blue and gold pen is a great gift for anyone. Gift boxed. Bush-Quayle Inauguration. A Black Duofold Centennial was commissioned in 1989 by the George Bush/Dan Quayle inauguration for January 20 1989. Three different pens have been found, with a bold signature, with a thin signature and sans signature. Presidential Inaugural Seal in gold. Box in black plastic and black velvet., printed Parker. Arkansas. In 1991 the then Governor of Arkansas Bill Clinton ordered 5 000 Duofold Centennials in preparation of his forthcoming 1992 run for the presidency. Insignia blue. Bill Clinton seal and signature. Vector roller ball black and steel cap Al Gore VP. Les Aspin Secretary of defense, Vector.